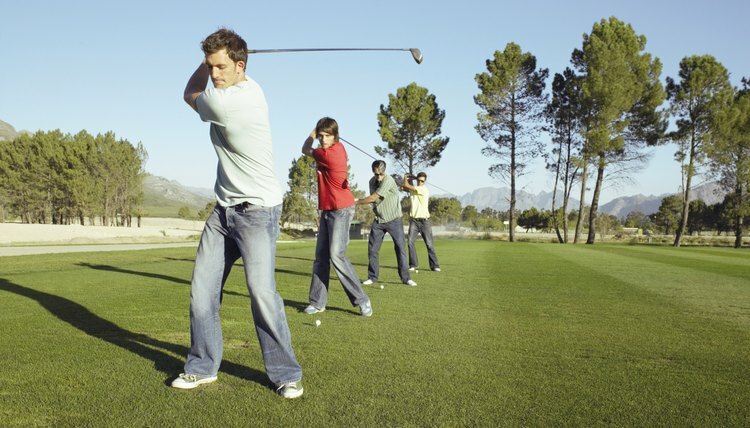 The practice range is the best place to learn the proper golf swing. When learning to swing a golf club so that your shots go long and straight, there are several things that you must do correctly. Because different areas of your body need to do different things, learning how to swing a club properly takes practice. In fact, the movements need to become second nature in order to be effective. Practice your grip. When swinging the golf club, keep your hands in one place. They should not move. The most conventional grip is the single overlap. To do this grip, the pinkie of your right hand should overlap your left hand’s index finger (if you are righthanded). Work on your posture so that you are in the most effective position to strike the ball. Stand with your feet shoulder-width apart and your toes pointing out about five degrees. Lock your legs and then unlock them and bend slightly. This is all the bending you need at the knees. You should bend from the hip as well. Remember to keep your back straight so that all the bending occurs in the lower body. This not only helps you hit the ball straight, but also helps you avoid back injury. Let your arms and hands hang straight below your shoulders. This allows you to stay even with the ball and aligned with the rest of your body. Begin your backswing by moving your club upward and backward. As you do this, shift your weight so that it now rests on your back foot. Simultaneously tilt your shoulders in a position that the front shoulder points downward and the right shoulder is pointing upward. Slightly lift the instep of your left foot as the weight is being shifted to the right foot. Let the club go back until your hands reach the area around your shoulder. Shift your weight back onto your left foot and move your hips laterally forward. As your golf club comes around, you should have almost all of your weight on your left foot. As you strike the ball, imagine you are actually striking two balls–the real one and an imaginary ball two inches in front of the real ball. This will help keep your swing straight and avoid slicing the ball. Your right toe should now be not supporting any weight. It is now merely providing you balance. Continue the follow through until your hands reach the front side of your shoulders.